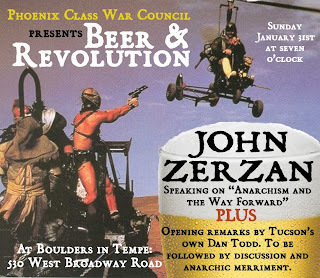 This Sunday: January's Beer & Revolution with John Zerzan! Sunday, January 31st, Phoenix Class War Council will be hosting its fifth (if we remember right) Beer and Revolution event. This is the first one for 2010 and we're stoked to have John Zerzan, anarcho-primitivist theorist and agitator. John will be speaking on "Anarchism and the Way Forward". Also, Dan Todd from Tucson, coming fresh from his book release the night before, will be giving some opening remarks under the provocative title “One Misapprehension, One Paradox, and Three Disparities”. The talk starts a little earlier than the last few (7 PM), so make sure you get there early. 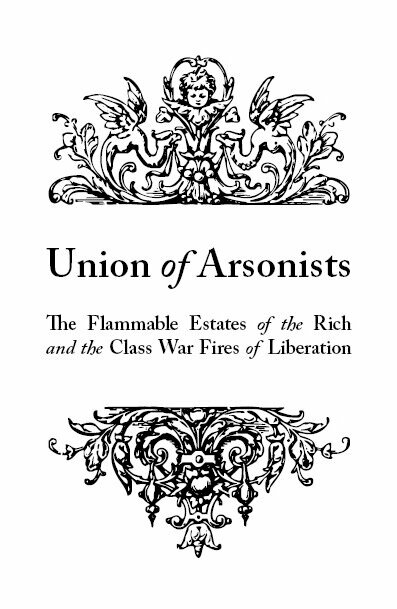 Plus, we'll have our book distro with us as well, so after the talk, please peruse our selection of anarchist and revolutionary books, magazines and pamphlets. Come by and enjoy an evening discussing revolutionary ideas with us at Boulders in Tempe (530 East Broadway). We look forward to seeing you there! "...the provocative title 'One Misapprehension, One Paradox, and Three Disparities'." I do hope his approach is Groucho-Marxist, because the title portends a tendentious ramble from the RCP's cult leader, Bob Avakian. did anyone record this talk? I'd like to hear it. Michael 23- Yeah, we recorded the talk, we'll have it up online as soon as possible, hopefully this week.